The Lunar New Year’s holiday is here, and South Korea’s roads and expressways are clogged with traffic as hundreds of thousands crisscross the nation to gather with family. But for people with family on the other side of the border -- in North Korea -- the national holiday is just another reminder of that separation. Korea’s turbulent history has taken its toll on the people, and particularly on families separated by the 1950-53 Korean War. At one time, government statistics show, 132,124 South Koreans were registered in a government database as having family members in the North. But only 56,990 registrants remained alive as of August, and nearly 80 percent were more than 70 years old. And those numbers don’t include the families of South Koreans abducted to the North during the war or those detained there in its prisons. With the national holiday coming up, many of these families had high hopes. The government had led them to believe they might catch a glimpse of their loved ones in a video reunion. But as international sanctions prohibit the South from sending equipment to the North for the event, the plan appears to have failed to materialize. Ahead of Lunar New Year’s Day, the Unification Ministry vowed steadfast efforts to arrange regular reunions for separated families. Unification Minister Cho Myung-gyon also paid consolation visits to people with family in the North. On Jan. 28, Cho hosted a luncheon for members of the Korean War Abductees’ Family Union. According to government data, 516 South Koreans are believed to have been abducted during the Korean War and remain confined in the North. In the afternoon Cho also paid a visit to Han Nan-sook, 92, who is from South Pyeongan Province in the North and whose family still lives there. Han came to the South with three aunts during the Korean War, according to the ministry. On Thursday, Vice Unification Minister Chun Hae-sung met with the family of Kim Jeong-wook, a missionary who was sentenced to life in prison with hard labor in North Korea after being found guilty of espionage and establishing an underground church. 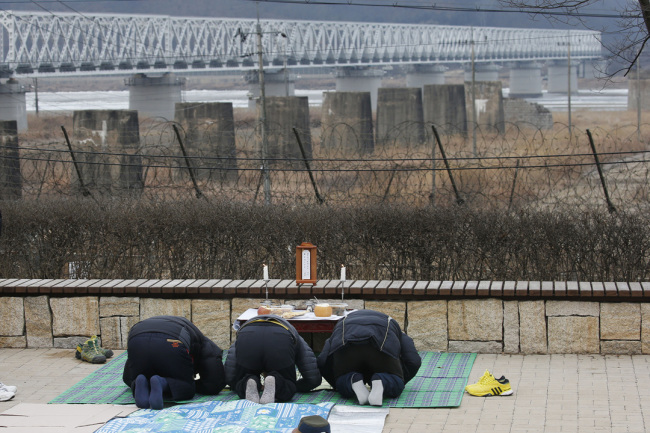 Kim had provided shelter to North Koreans in Dandong, a Chinese city that borders the North, and taught the Bible. But he was caught when he entered North Korea in October 2014. During their meeting, the vice minister said the government would make efforts to obtain the safe return of all detainees in North Korea. On Lunar New Year’s Day, which falls Feb. 5, the unification minister is expected to take part in joint ancestral rites with some 1,000 members of separated families at Imjingak Pavilion, near the border with North Korea. With the thaw in inter-Korean relations following the summits between the two leaders, the two Koreas are seeking to increase cooperation. On the upcoming 100th anniversary of the March 1 Independence Movement against Japan’s colonial rule of the Korean Peninsula, they are planning on celebrating the event together.